In preparation of your CCNA exam, we want to make sure we cover the various concepts that we could see on your Cisco CCNA exam. So to assist you, below we will discuss on of the more confusing CCNA concepts, Cisco Cables for your CCNA, CCNP & CCIE Lab. Hopefully this article will help you unravel the Cisco cable mess so you can identify what cables you will need for your Cisco certification lab! For the beginner who is building their Cisco CCNA, CCNP or CCIE certification lab, it can be overwhelming when people are throwing out terms at you like console cable, rollover cable, crossover cable, back to back cable, DTE/DCE crossover cable and such. Some of them are even the same thing, just said different ways. So I am going to try to make your Cisco lab life easy by explaining each of the types of cable you will need for your Cisco home certification lab and even a few of the variant terms you may hear them described as. 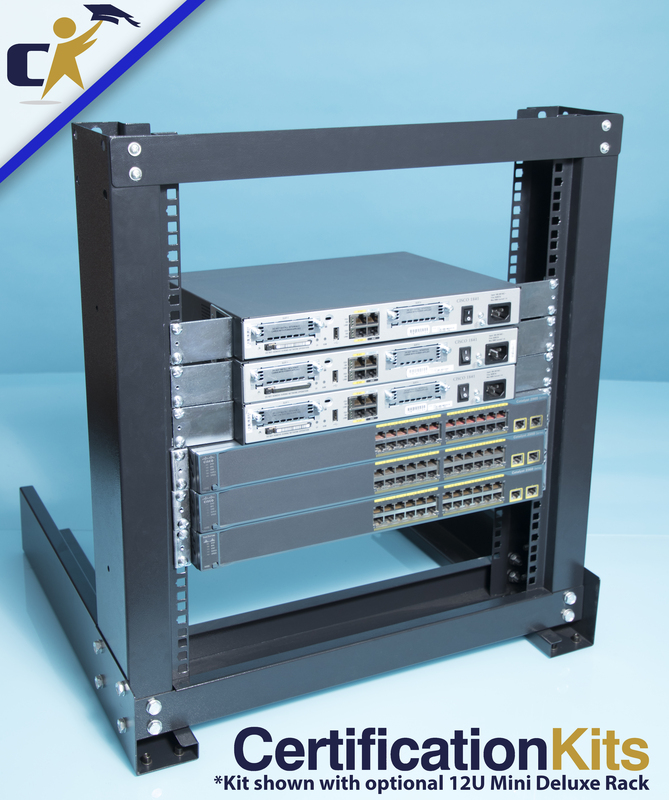 The first cable or cable kit we will start off with for your Cisco certification lab is the Cisco Console Kit or Cisco Console Cable. This can come in a few different versions. The most common version of it has a 9 pin female serial connector at one end that will plug into the 9 pin serial port on your computer. The other end is always an rj-45 style end that will plug into the console port on your Cisco router or Cisco switch. Hence the name console kit. This cable can either come as a one piece kit or a two piece kit. In the one piece kit, the 9 pin adapter is molded onto the end of the rj-45 style cable. This is the most common version of the kit now days and you can click on the link to see an example of one. However, you may also see the two piece kit in which you will get a special 9 pin female serial adapter that will have an rj-45 input on the other end. Into this end you will plug in the Cisco rolled cable. This is not a normal Ethernet cable and you cannot use an Ethernet cable for this. Ok, next for your Cisco certification lab you want to know what is a Cisco rolled cable. When if you take a look at a normal Ethernet patch cable, you can take both ends and hold them up side by side with the clip pointing away from you. You will see that the color of wire one(the one on the far left) is the same on both ends of the cable. If you scan the rest of the cable, you will also see that the color of all the wires going from left to right are the same on both ends of the cable. However, if you do the same thing with the Cisco rolled cable, you will notice they are inverted or swapped. So let’s say you are holding both ends of the cable up with the clip pointing away from you. The end on the left, pin one which is to the far left may be colored green. Therefore the end on the right, the green pin will be pin eight on the far right. So they are the complete opposite. You can click on the link to see an illustrated example. Since we mentioned an Ethernet Patch Cable above, we might as well talk about it now. You may also hear this termed as a straight through cable. Why? Well if you hold up both ends of the cable again with the clip point away from you, you will notice that going from left to right that the sequence of colored pins are the same. For instance, the end on the left with pin one being green, when you look at the cable on your right pin one will match and also be green. This will be the same for all eight strands in the Ethernet patch cable. Now when will you use an Ethernet patch cable? You will use an Ethernet patch cable to connect your PC to your Cisco switch or Cisco hub in your Cisco lab. You can also use an Ethernet patch cable when you are connecting your Cisco router to your Cisco switch. The most common type of Ethernet patch cable that you will come across today is the Cat 5e Ethernet patch cable. Cat 5e is the specification which tells you the characteristics that the cable must meet to be certified as Cat 5e. Things such as a 100 meter length limit, connector types and such which are defined in the TIA/EIA-568-B specification. That brings us to our next type of Cisco lab cable which is another Ethernet based cable, but this one is the Crossover cable. A crossover cable is very similar to an Ethernet cable. In fact, you can easily confuse it for an Ethernet cable if you do not look at it closely. Usually it will be printed on the cable that it is a crossover cable. But another way to tell is to again hold both ends of the cable up with the clips pointing away from you. Instead of the color of the cables in the end being the same on both ends going from left to right, pins one and three and two and six are crossed on one end of the connector. Hence the term crossover cable. This crossover of the wires is usually done inside a Cisco switch or a Cisco hub that you are connecting your end nodes to. So if we think about it this way, you want to connect your pc to a server. You connect your PC to a Cisco switch via an Ethernet straight through patch cable. The Cisco switch then crosses these wires over internally and then you have an Ethernet straight through patch cable going out your Cisco switch to your server. So you see what happened there? The Cisco switch crossed the wires internally. Now let’s say you do not have access to a Cisco switch or Cisco hub and you just want to connect a PC to a server. How can we get around that? We can use a crossover cable! What are some other uses for a crossover cable in your Cisco certification lab network? We can use a crossover cable to connect a PC or server directly to a router port or if we need to connect two Cisco switches to each other. You definitely want to memorize when to use an Ethernet patch cable, a crossover cable and a rolled cable. You will more than likely see these terms on your Cisco ICND1, Cisco ICND2 and Cisco CCNA test. I have always found the best way to memorize this sort of thing is by actually doing it. I never could just memorize it until I messed it up in my Cisco home lab environment. Then it stuck in my head. Now let’s move on to different serial type connections you may encounter in your Cisco CCNA, Cisco CCNP or Cisco CCIE home lab. You have probably heard the term back to back cable or dce/dte crossover cable on occasion. Well, they both refer to the same type of cable. It is just it seems like to different terms have stuck here for the same item. So why is that? Well, let’s look at what the cable really is and that will help us understand the roots of how the names of back to back and dce/dte cable came about. Let’s say you have two offices. One in New York and one in Chicago. You want to connect the two offices together and have a private network between them in which you do not share with anyone else. You will call up your local telco company and request a T1 line be installed between the two offices. So basically it will be like you have a very long line connecting the two offices together. Now since this connection is in essence it’s own subnet, you will need a router on each end to route the data between the two offices. In each of those routers, you will have at least one serial port. You will use this serial port to make the connection between the two offices. Now as a side note, you should know that all Cisco routers are DTE devices. DTE stands for data terminal emulation. That is just a fancy way to say this device can convert our data into signals and reconvert these signals into our data that it receives. Now our router is going to be connected via what is called a DTE/DCE serial cable to a DCE device. DCE stands for data circuit terminating device. Remember that we stated we wanted to connect our New York office to our Chicago office and we were going to have our telco company provide the circuit for us? Well what they do is they put a DCE device(which is a CSU/DSU) at each office. They then program the two DCE devices so they can communicate to each other through the telecommunication cloud. We won’t get into all of that in this article. So for now they know how to communicate with each other to get your data from the CSU/DSU in New York to the CSU/DSU in Chicago. The DCE device will provide clocking to the DTE device. This synchronizes the transmission of the data between the devices. So let’s review. You have your DTE router in New York connected to your DCE CSU/DSU in New York via a single DTE/DCE serial cable which is connected to your DCE CSU/DSU in Chicago which is connected to your DTE router in Chicago via another DTE/DCE serial cable. Is the picture starting to form now? So you have these two DTE/DCE serial cables in essence connected to each other back to back. That is how the term back to back cable came about. In fact, the original way that this was done was to have two of these cables physically plugged into each other to form the Cisco back to back serial cable. Now these are very expensive cables that tend to run about $75 each. So that is a bit pricey or a lab. So someone came up with the great idea to make a molded cable that actually did the crossovers in a one piece cable that is accomplished by connecting them back to back. Thus you have the term DTE/DCE crossover cable. So you now see the origins of such a cable and how the names seemed to have evolved. I hope you found this article helpful in unravaling the tangled web of cables you will encounter in your Cisco CCNA, CCNP and CCIE certification lab!